As a child I loved getting an Easter basket filled with candies and toys every year. Now, as an adult I continue to love having baskets all decorated for the Easter season. Why give up a joyous experience just because you get older? 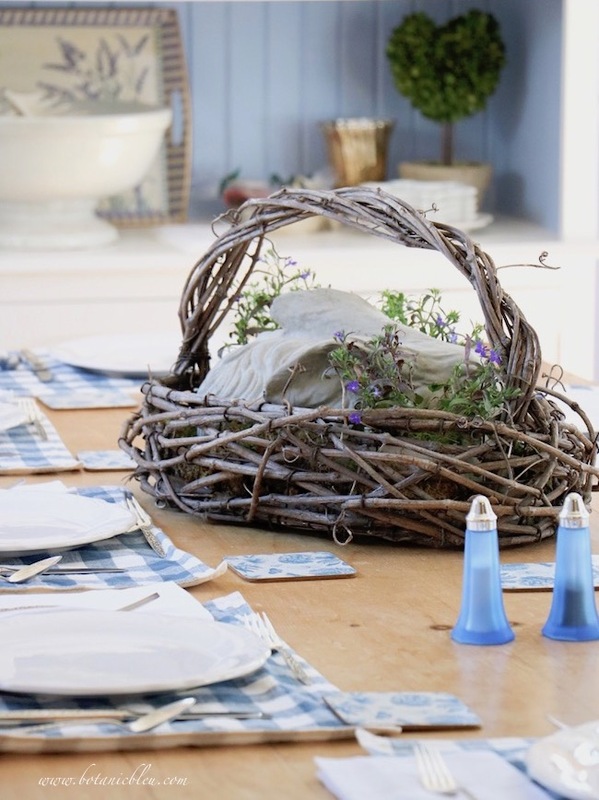 Bring out your baskets and celebrate the season with a special basket on your dining table. You will not be the only one enjoying a basket decorated for the season. 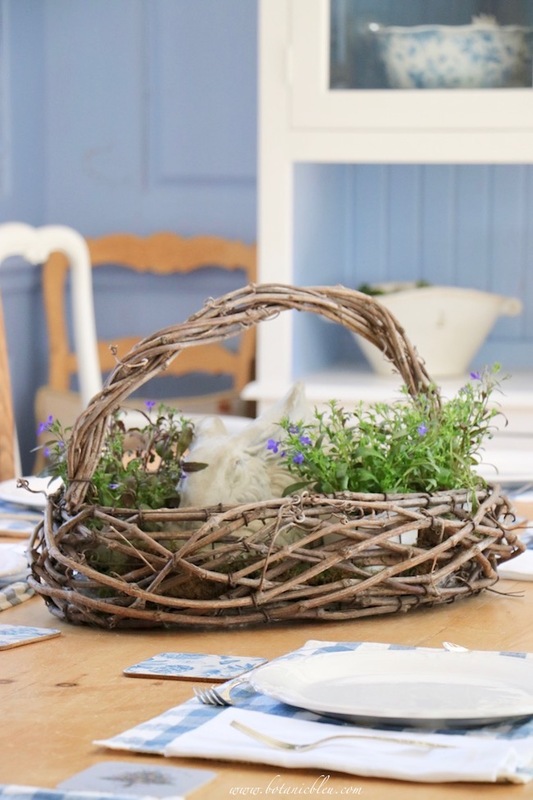 Grown children who no longer live at home and who are coming over to visit will enjoy seeing a lapin (bunny) basket which will bring back many happy memories of their childhoods. Chances are a basket will spark conversations and stories among them of their own favorite baskets as children. They will also be happy to see their parents (YOU) are still enjoying life and celebrating the changing seasons. Sort of reassurances that all is well with their parents' health and outlook on life in general. 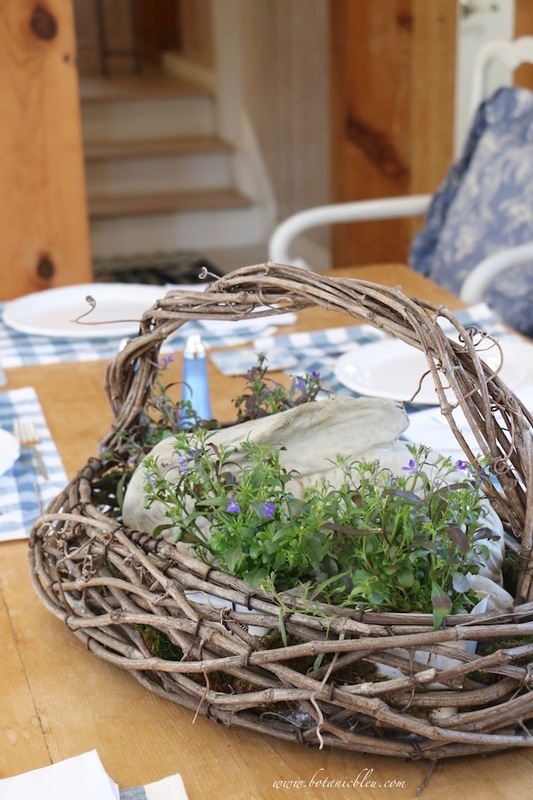 If you are having guests for book club, bridge, girl's lunch, etc..., all the more reason to create a special spring basket for a centerpiece. Friends gathered for lunch enjoy special centerpieces and always remark about them. They too, still enjoy Easter baskets as adults. 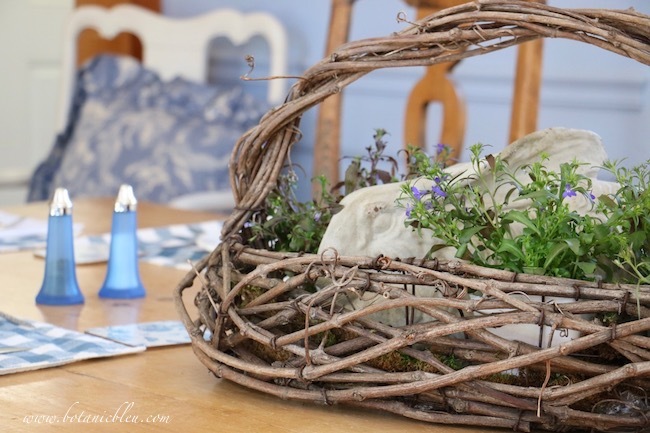 To create a similar French Country floral bunny basket, you only need a handful of materials and NO flower arranging skills. A basket, a lapin, and two or three four-inch bedding plants are the major parts. Two more items make the arrangement better. ① A piece of plastic to line the bottom of the basket prevents water leaks from the bedding plants dripping onto the table. ② Green sheet moss fills in the spaces between the inside of the basket and the plastic pots holding the plants. A little bit of green moss is visible in the photo, but more needs to be used to hide the white pots better. 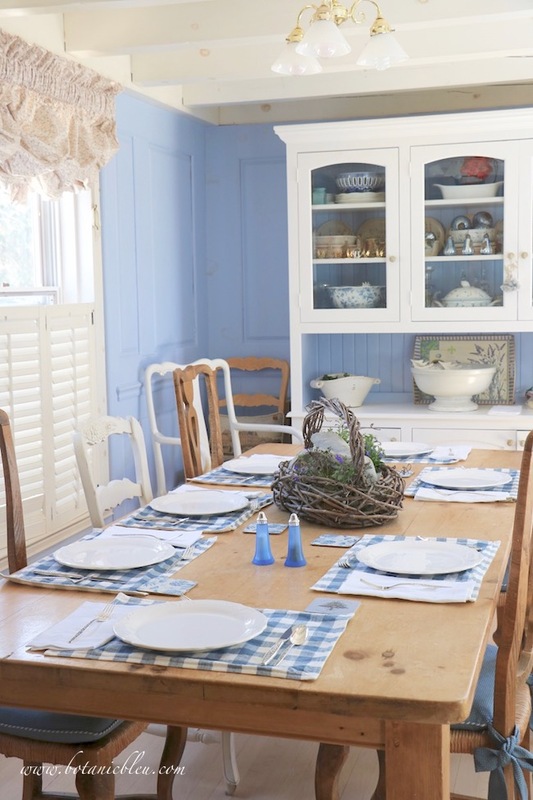 Choose bedding plants to complement your home's colors or your table setting colors. White is always an option if you cannot find plants in the color you need. White sweet alyssum is a good variety for using in floral baskets. 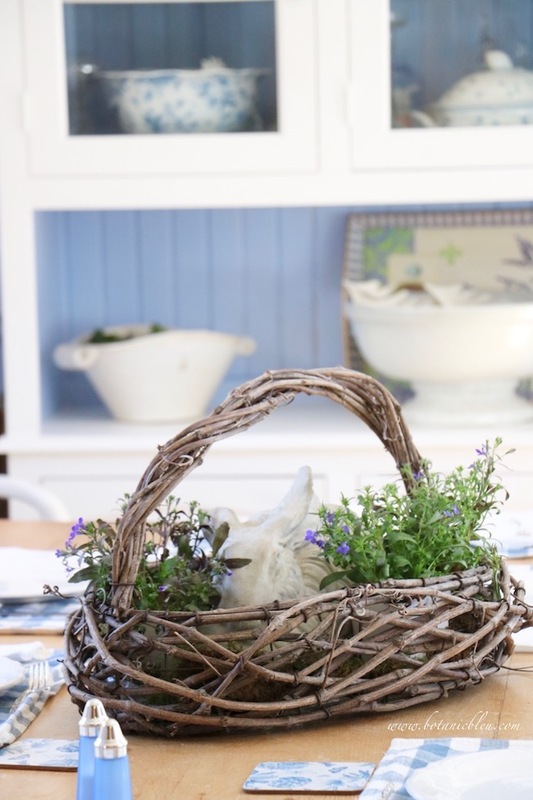 The plants in this arrangement are annual blue lobelia and are readily available at most nurseries. They grow as far north as Victoria, Canada and all across Europe in window boxes and hanging baskets. They also grow in north Texas. Annual lobelia comes in a range of colors including white with tiny blue centers, soft lavender, medium blue, and dark cobalt blue. Both lobelia and sweet alyssum are good choices because they drape over the edges of containers. No flower arranging skills are needed to make them look good. Just insert a couple of plants on one side of the bunny and insert one plant on the opposite side/end of the bunny. 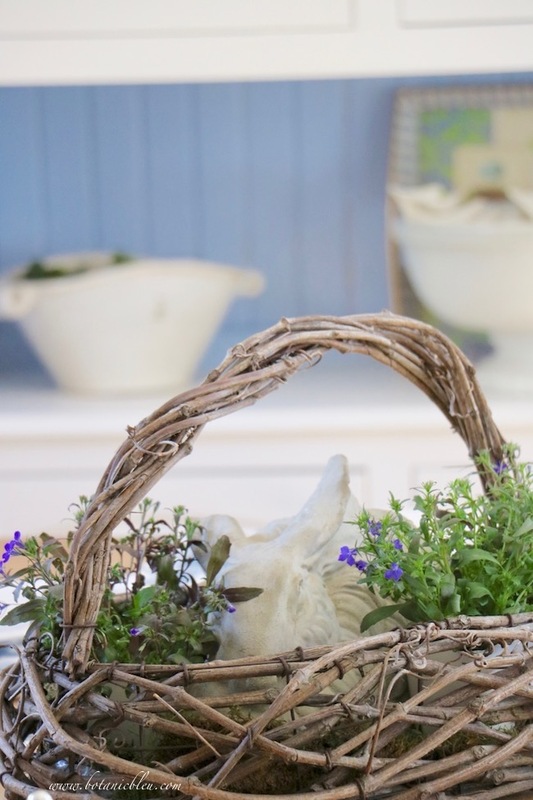 Minimal supplies and no flower arranging skills make this French Country floral bunny basket an easy way to continue to celebrate Easter baskets as adults. 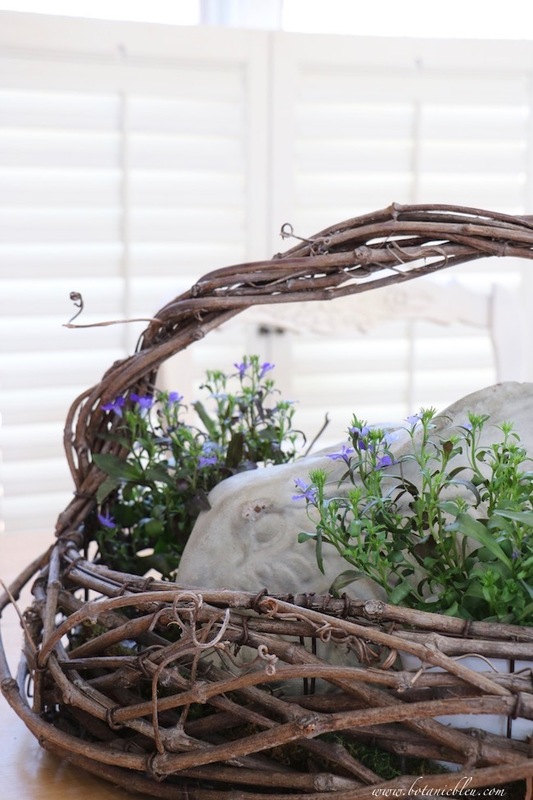 Both the rustic twiggy basket and the concrete fluffy bunny have been a part of many previous Easter baskets. During most of the rest of the year, the bunny resides on the stone hearth near the fireplace and has suffered a few dings over the years. 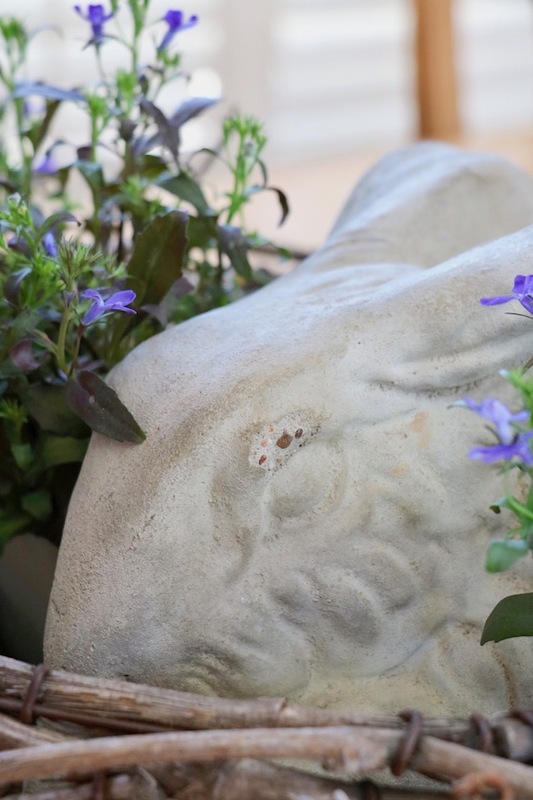 Much like the Velveteen Rabbit, this concrete bunny is still loved regardless of his appearance. Whether company is coming or not, a whimsical floral bunny basket is a good way to celebrate spring and to enjoy a tradition from childhood. You may enjoy seeing other spring baskets. Now this is my type of Easter basket Judith! Thank you so very much for linking to the Spring and Easter Joys party. Have a very Happy Easter! Judith, I still love Easter baskets. They are fun to receive, but even more fun to put together. I bought two of the extra large paper mache eggs from Pottery Barn Kids last year and put them back to give to my little grand nieces this Easter. I filled them with a stuffed bunny, candy, and a few toys. I hope they find them fun. I wanted to do something different from a basket since they will get that from the Easter bunny. Your bunny in the basket reminds me of my sweet bunny on the front porch. I brought him home from an antique show last January. Sweetest faces! This is so gorgeous! Thank you so much for sharing at the Spring and Easter Joys Link party! You are welcome to link up any of your beautiful posts each week at Thursday Favorite Things too. The party starts at 9:00 a.m. EST on my blog. Happy Spring! Judith, what an enchanting Easter basket! Love the rabbit! That's the sweetest basket display I've seen recently. Love it. Very sweet basket! I love the twig basket and your bunny is adorable. I still have the Easter basket I made on my dining room table. I just don't want to put it away yet! That is precious. I used to have grapevine baskets. I wonder what I did with them. Thanks for linking up to Keep In Touch.